Week 3 is now done and dusted. To say I am exhausted doesn't even begin to explain how I am feeling. After finishing school yesterday, I was so glad we had our MDTA learning today. Don't get me wrong, I enjoy teaching and I love being at school, but man, it's a nice break. Here's my beautiful cohort, I am privileged to be working with. I am 100% a learner. I need to be learning something all the time. So 'Uni Fridays', as I am referring to them, are glorious. We are learning many new things every day. This morning begun as a basic introduction to the history of Manaiakalani, how the Trust and the cluster (and us, the cohort!) got to be where we are now. The adventure and hours of work the staff and students, especially Dorothy Burt, have pushed through is incredible. Although I had a basic understanding of how Manaiakalani, and the MDTA, came to, I was still astounded by the groundwork that has been put in - and so many people don't even know about the incredible work that is happening! After our history lesson though, my favourite part started - the digital learning. 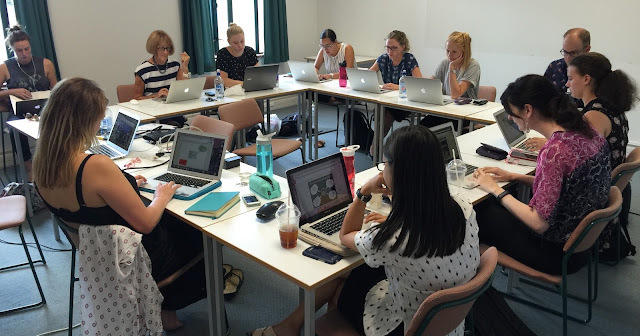 Today was a how to for Google Sheets and Google Forms. I knew more than I thought I did about Sheets, because I am quite comfortable with Microsoft Excel, but it was helpful to revise the basics as well as learn some simple tricks of the trade such as freezing and hiding columns/rows. I was mostly engaged when we were learning about Google Forms. Each week we have to create something to reflect what we are still thinking about from our learning throughout the day. As you can see, I included my Form I created, and mentioned the key learning tips I gained from the session. Google Forms are going to become a major part of my classroom, to assess my students' learning formatively, diagnostically and summatively. This will benefit students, my co-teachers and myself to determine what knowledge they understand, and what needs to be revised. In addition, I think the use of Google Forms can be utilised for students to create their own revision sessions, rather than the teachers creating a Form. By creating their own Forms, students are revising knowledge themselves, because they need to provide the correct answers, and they are able to take ownership of something the students are working on. This directly increases student engagement and student-centered learning. Now I cannot wait to include Forms in my teaching, possibly Monday Period 1? 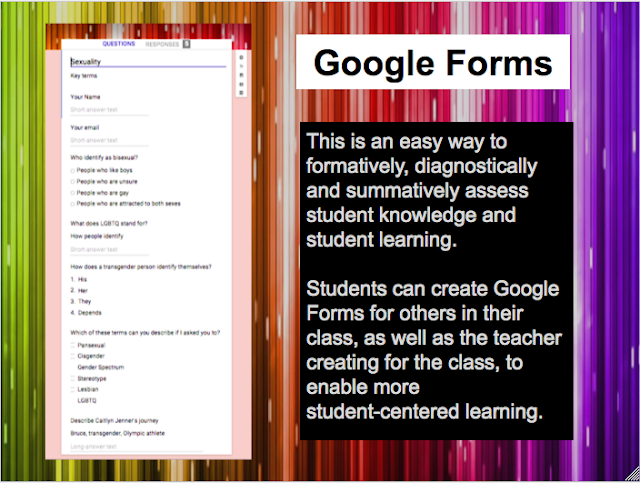 If you are interested, check out my first Google Form I created today!